All widely cultivated bananas today descend from the two wild bananas Musa acuminata and Musa balbisiana. While the original wild bananas contained large seeds, diploid or polyploid cultivars (some being hybrids) with tiny seeds are preferred for human raw fruit consumption. These are propagated asexually from offshoots. The plant is allowed to produce 2 shoots at a time; a larger one for immediate fruiting and a smaller "sucker" or "follower" to produce fruit in 6–8 months. The life of a banana plantation is 25 years or longer, during which time the individual stools or planting sites may move slightly from their original positions as lateral rhizome formation dictates. Cultivated bananas are parthenocarpic, which makes them sterile and unable to produce viable seeds. Lacking seeds, propagation typically involves removing and transplanting part of the underground stem (called a corm). Usually this is done by carefully removing a sucker (a vertical shoot that develops from the base of the banana pseudostem) with some roots intact. However, small sympodial corms, representing not yet elongated suckers, are easier to transplant and can be left out of the ground for up to 2 weeks; they require minimal care and can be shipped in bulk. It is not necessary to include the corm or root structure to propagate bananas; severed suckers without root material can be propagated in damp sand, although this takes somewhat longer. In some countries, commercial propagation occurs by means of tissue culture. This method is preferred since it ensures disease-free planting material. When using vegetative parts such as suckers for propagation, there is a risk of transmitting diseases (especially the devastating Panama disease). As a non seasonal crop, bananas are available fresh year round. In a skillet, melt butter over medium low heat. Once butter has melted, add brown sugar, cinnamon, ground ginger and bananas, Stir gently. Heat through, about 5 to 7 minutes. Serve warm. Enjoy! I bet this would be great over ice cream. Those look SO good... I could seriously eat them by themselves or on top of some french toast, or ice cream... Or both... haha! Interesting information, we grow bananas and it has been hit or miss. We just tried a similar from the Perfect Scoop. The banana mixture was blended into milk. It was ok. I think a ribbon of the banana mixture would have been a great success. I think the ginger in your recipes sounds better too. I think I would enjoy the classic taste and eat these by themselves. 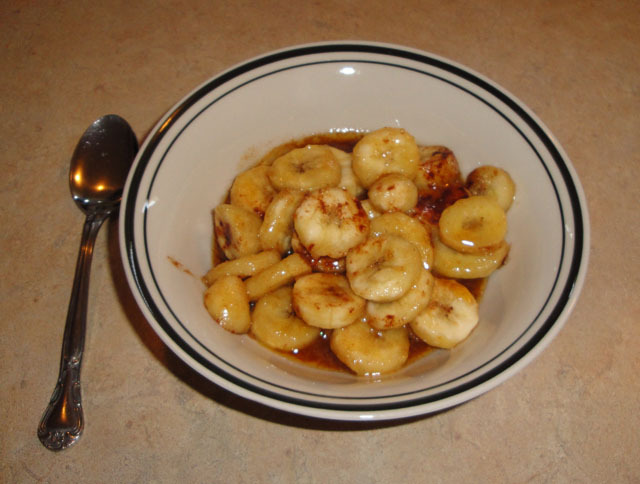 Carmelized bananas have such a nice flavor and dishes like this I have seen served for dessert at several restaurants. Nice post-Yum! This is so creative. It looks so delish! Mmmm, sounds tasty and easy. Will try them one day. Hi Bo, good to see you back. This is perfect over ice cream. Hi Tina, you've seen dishes like this served at several restaurants... that's awesome. Thank you! We eat all sorts of caramelized bananas in the Philippines and I like them all. I like this recipe of yours because it has cinnamon. Perfect with ice cream or pancakes. Agree with Adora, I was thinking about putting on top of ice cream or pancakes/waffles! Great idea! I would love to have your banana with pancakes. Haven't have banana for a while as it is very expensive after the Queensland flood. Totally love bananas and these sound sinful, I love the thought of making these for a weekend morning breakfast! I'd have to skip the cinnamon, but this looks amazing! Thank for the history - as always...you really have a great way of making the most ordinary ingredient interesting! Yum...this reminds me of Bananas Foster. So good over vanilla ice cream!! Yummy as a stand alone or with a myriad of other things. I am loving this snack. I cannot wait to try this...need to go buy some bananas on my way home from work! I love bananas. I would eat this for breakfast over oatmeal or French toast. It would also make a fantastic dessert over ice cream.